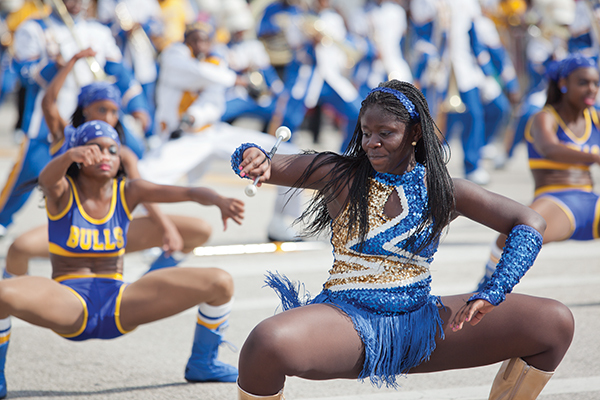 Dancers and baton twirlers from Miami Northwestern High School performed in the 24th annual Martin Luther King Day Parade on Monday with the marching band from the Liberty City school. The parade started along NW 62nd street in Liberty City, Martin Luther King Boulevard, and ended with vendors and festivities at Martin Luther King Park on NW 32nd Court. The parade included floats and convertibles with county political figures, high school marching bands, and fire engines. The day held double importance for the attendees as it was also the day of President Obama’s second inauguration.